In this SI 60 selection, Curry Kirkpatrick spends two days playing golf, tennis and other games with President George H.W. 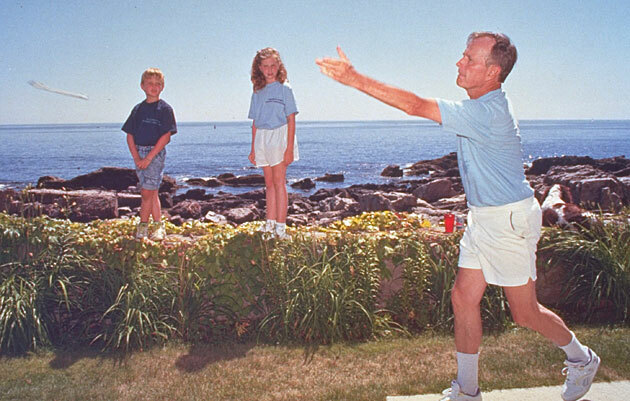 Bush at Kennebunkport for the 1991 story "Playing In The Bush League." In honor of Sports Illustrated's 60th anniversary, SI.com is republishing, in full, 60 of the best stories ever to appear in the magazine. Today's selection is "Playing In The Bush League," by Curry Kirkpatrick, which originally appeared in the Aug. 19, 1991 issue. On a visit to Kennebunkport, the author barely kept up with a sporting Prez. They were a dead giveaway, all twisted and jangling and nerve-racked. Somebody on the other side of the net had obviously noticed their deteriorating condition before striking the historic lob that drifted malevolently on high, back somewhere between the service and baselines, where I would have a difficult time crushing one of my spectacular overheads anywhere within the confines of the state of Maine. I say historic because when I drifted back, set up perfectly, swung and . . . missed the ball completely, it was the single most embarrassing moment in the history of my life. The worst part was, I couldn't blame my whiff on the blazing sun, the soft ocean breezes, the Laykold hard-court surface or, especially, the footsteps behind me, which belonged to my partner, who also happens to be the leader of the free world. ''Shake it off. Tough shot. Let's go,'' said George Herbert Walker Bush. "That's easy for you to say, POTUS," I said. "If you don't blow the service return on set point a few minutes ago, we're out of here, and I don't get the chance to humiliate myself." I didn't say that out loud, of course, my partner being my newest close personal friend, not to mention the President. POTUS, by the way, is the acronym for President of the United States, a term used only by close personal friends such as myself; Sig Rogich, POTUS's "image adviser''; and Jenna Bush, 9, one of POTUS's 4,000 or so adorable grandchildren. For some strange reason, I remembered POTUS's marvelously cryptic remark about ''the celebration thing'' in honor of his 67th birthday on June 12, which was "Nice cards. Nice cake. Not bad." Suddenly, I felt at ease again. In keeping with the cryptic thing, I guess ''easy'' is as good a word as any to define the atmosphere pervading the several hours the President spent sharing his vacation with me over two days last week in Kennebunkport. Bush knows how to lay back, relax and do the easy thing all right, but he also knows how to keep everybody else relaxed and feelin' easy, which is probably more important for a guy who has had to put up with the likes of Joe DiMaggio, Ted Williams, Mikhail Gorbachev, Kevin Costner and, ahem, me, over the last month, in addition to preserving the peace, avoiding the teller windows at B.C.C.I. and saving the planet from the Democrats. By now all Americans surely know how enthralled the 41st president is with sports. Soccer at Andover. Baseball at Yale. Jogging along the Potomac. Bonefishing off the Florida Keys. Golf. Tennis. Horseshoes. (''We finally got Schwarzenegger over to the White House for some 'shoes,'' POTUS told me when I was at the White House last year, lining up our vacation together. ''He fired a few line drives, real Exocet missiles, and almost broke the pool house. But we hooked him. The guy went out and built a pit by his own house!'') Swimming. Ping-Pong. Wallyball (indoor volleyball on a racquetball court). Even tiddledywinks, for god's sake. The man's enthusiasm, vigor and absorption with sports, especially while at Kennebunkport, boggles the minds of his staff members. They get exhausted thinking about his nonstop activity. ''He's playing singles,'' one staffer says, ''while we're drinking doubles.'' In short, to coin a phrase, POTUS knows sports. The Bush family can even make a sport out of fruit gathering, as Barbara Bush did last Thursday, about the same time I was fanning that overhead into my eternal hell. ''Where were you?'' I asked, fairly crushed she hadn't seen my one or two good shots. "Took the grandchildren to pick blueberries," POTUS's wife said. "Whoever filled their bucket first was the champion. Millie went, too. Oh, it was grand fun." At the sprawling 11-acre Bush compound at Walker's Point -- known as Gawkers Point to native Kennebunkporters weary of the tourists who have turned their picture-postcard village into one massive traffic jam/photo op -- the pace is frenetic, the athletic activities unlimited, the schedule crammed to the gills. 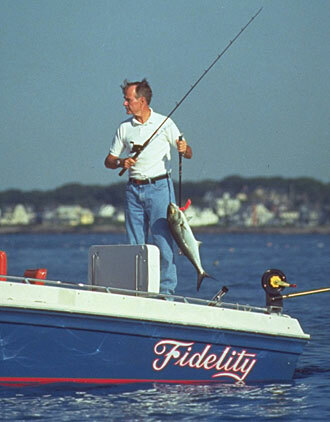 (Speaking of which, I am proud to report that POTUS's fishing slump is ancient history; he reeled in an 11-pound blue barely 12 minutes after blasting off from the pier in his modified Cigarette boat, Fidelity, at 8 a.m. on Aug. 7.) That's why it was fairly astonishing that POTUS not only acknowledged me as his main Maine man and fitted me into the mix but also didn't blanch once or come close to throwing me out. Not even when Rogich parked my golf cart directly in the line of his approach shot to the 4th green at the Cape Arundel Golf Club -- ''Do you mind, guys? We're having a game here,'' POTUS said -- or when I stumbled to a particularly suave half gainer almost on top of his prize bluefish while boarding his boat, or even when one of my normally surefire twirled horseshoe pitches nearly massacred an innocent family bystander, that being the best-selling author, Millie, the First Dog. At play with POTUS started for me on the afternoon of Aug. 7, when I watched Bush's daily ritual of "cart polo," which is what POTUS's regular partner, Arundel pro Ken Raynor, calls golf as it is played by the President. When his staffers ask whether POTUS broke 90, they're talking minutes, not strokes. Sure enough, on the morning Bush left for the economic summit in London last month, he and Raynor raced around a full 18 in an hour and 25 minutes. ''My alltime record,'' the President told me proudly. Bush's grandchildren are used to watching Gampy, a southpaw, pitch horseshoes with his left hand, though he plays tennis as a righty. POTUS used to play to an 11 handicap, but thanks to the yips, he's nowhere near that now. A 48-inch Pole-Kat putter, says Bush, "saved the game for me." POTUS means he has fewer four-putt greens. His friendly opponents seem to give him anything inside eight feet. The President is a solid striker of the ball, though, with a short Doug Sanders-like backswing, a natural fade ("You're kind," he said. "That's a full-bore slice") and surprising power through the swing. "I've got no idea how to do this," he kept saying each time he bent over a short chip shot. There were several expletive-deleteds , too. "Whoops," POTUS said when he noticed a female twosome had watched him make hash of the 8th hole. "I hope those ladies didn't hear me. I wouldn't want them to think less of their President." On the links POTUS is always friendly and accommodating to strangers. "That was a darling effort," he snarled after popping up his drive off the 17th tee. Then he spotted a pretty young woman on a cart. "That your daughter?" he asked a waiting golfer. "My girlfriend," the guy said. "Uh, she's beautiful," the President said, trying to save bogey. But how terrific could any golfer be if he had to pose for pictures and sign autographs on almost every hole and had to face prying international media jackals at 1, 9, 10 and 18, the way POTUS must do at Kennebunkport? Before trying his 12-foot putt for par on 18, the President waved his playing companions out of the photographers' sightlines. ''If I miss, it's a team sport,'' he said. ''But the media obviously have a feeling something great is about to happen.'' Alas, POTUS rolled another putt wide. His team won, but as usual the White House did not release an official score. Wouldn't be prudent. Anyway, with all the gimmes, pickups and presidential grumblings of ''that's it,'' total accuracy is sacrificed out of respect for the office -- or something. On the botched-up 8th, for instance, Rogich gave POTUS a 7 but changed it to a 6. I counted at least an 8. ''He is, after all, my President,'' said Rogich, who marked an 81 on his President's scorecard. POTUS loves to talk about the Bush family Ranking Committee, a nebulous organization that supposedly assesses the sporting capabilities of potential competitors. POTUS loves to have the edge. ''You know, the Ranking Committee hasn't yet come in on you for our tennis game,'' he told me as I was chatting with Mrs. Bush at the golf club. "You want to hit against a ball machine or something?" "Hey," I said, totally insulted, "I don't do no auditions." What I really said was, "Hey, call your buddy Chris Evert. I've hit with her." Well, I had -- when the President's and my close personal friend was about 12. "Hey," said Barbara Bush, playing Bad Cop Babs again. "Don't think we won't call Chris." The next morning I was whisked aboard Fidelity, whereupon the President introduced me to "Bob Gates, who is just about to catch something." While Gates, the nominee for director of the CIA, gazed out to sea, looking for either a school of blues or the Senate Intelligence Committee, POTUS informed me I had been approved for the tennis game that would take place when we got back. "Ranking Committee called Chrissie," said the President. Sure, POTUS. "Say, how do you know Chrissie, anyway?" "Oh, I helped invent her," I said. "Well, I was the first one she told she was pregnant -- after her husband," he said, ever the one-upman. Though I live on the ocean, swim in it and love boats, I don't do fish. Never have, never will. Nevertheless, the President's enthusiasm for the rod and reel and the chase and catch is so palpable, it is almost infectious. Almost. "There they are! Look at that!" POTUS called out as he trolled for blues. "Damn, it's exciting when they come up top like that! They're in a feeding frenzy! See that? See 'em?" "Wow!" I said. I couldn't see squat. On the way back to land, the President took the wheel and let out the throttle to 39 knots or so, obviously relishing an attempt to lose the multitude of panicked guard boats scrambling to catch up. Four years ago, when Bush pulled this James Bond-style speed number, NBC news correspondent Tom Pettit was caught unawares, went flying and hurt his back. Pettit was in a back brace, and he still has back pain. "Yeah, I remember! Quite a spill!" screamed POTUS over the combined roars of the wind, waves and engines. "Now watch yourself." He banked Fidelity left, toward the rocks abutting Ocean Boulevard, and then cut a sharp right back to his home on the promontory. Riding shotgun, I found myself hurtling practically into the sky as the President, on my right, almost seemed to be underwater, so low was his side of the boat as he curled into the pier. "Boy that's neat, isn't it?" he said. "I love that part." Needless to say, POTUS's friends in the trailing boats don't feel quite the same about that part. By the time I had swallowed my heart back down to where it had come from, it was tennis time. My big moment. My time to kick rear and take a chief executive name. 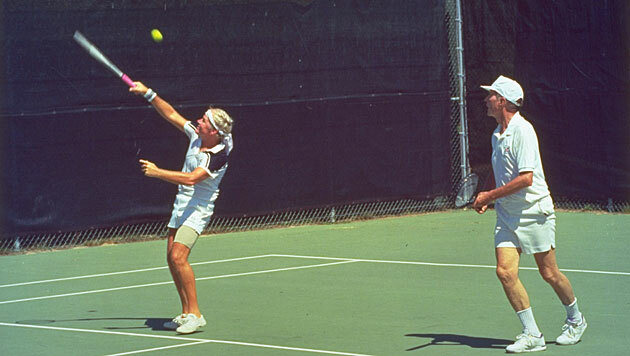 The moment I had trained for -- well, at least had hit a few balls for -- under the canny eye of Rusty Dyer, my home pro at the Shipyard Racquet Club in Hilton Head, S.C., had arrived. We had worked assiduously on my singles game and on a double-fisted backhand return. "When the President serves that lefty floater, go ahead and crush it, and he's history," Rusty had said. Now, Rusty may be history. First, tennis time consisted only of doubles, which was a big disappointment to me because after that remark about a ball machine, I wanted POTUS bad. Next, although he's a natural lefthander (he throws and writes lefty), the President plays tennis righthanded. Finally, I never got on the opposite side of the net from my intended victim because POTUS chose me as his partner. Moreover, he actually announced he was making us the favorites over Marlin Fitzwater, his press secretary, and Dorrance Smith, the former executive producer of ABC's Nightline, who joined the President's staff earlier this year. "I apologize for the Ranking Committee's long delay in according you the proper respect," POTUS said as I ripped topspin drives, nonchalantly blocked volleys and moved like a gazelle during the warmups. Little did the President know that when the bell rang, by characteristic rote, I would turn into tennis's most pathetic hound. To make a sad story short, I opened the match by losing my serve after being up 40-15. We broke Fitzwater back, but then the President dropped his serve. I held for 2-3, but that was the last game we won in the first set. Smith, 40, was a ringer. He was obviously hired by the White House to play DTHM (designated tennis hit man) as much as to improve the President's media relations; Smith hasn't missed a ball in two or three years. Even Fitzwater, who's as affable as he is burly, kept slugging deep returns that POTUS and I could do nothing with. As for the President, he kept warning me about his ''no serve,'' which turned out to be a lunging, soft delivery. "Screwed up as a youth," he said. "In those days you weren't allowed to be lefthanded. When my mother switched me from being a lefty, I was without any natural motion." If that had made any sense, I would have asked Dorothy Bush, 90, about it, because she was sitting courtside -- which by the way was also oceanside -- and was fresh as a summer day in a gorgeous pink flowered dress and straw hat. As my "nerves factor" lessened in the second set, our team came on. I lucked out on a couple of power and touch plays, to which the President responded, ''Stradivarius! Mr. Smooth! Way to go. You're playing them like a Stradivarius!'' Once, after I had fooled Fitzwater with a move at net, he screamed, ''Totally outsmarted me; I hate when that happens!'' -- as if it had been happening since the Bush house on Walker's Point was built by the President's grandfather in 1903. Another time POTUS, moving in on a setup overhead, cried out at Fitzwater, ''Marlin! Surrender or throw down your arms!'' Then he crushed the ball inches from Fitzwater, who already had taken one nasty tumble scrambling after a presidential smash. My partner, facile at net, with wondrous hands, started to knock off backhand angle volleys that Stefan Edberg would envy. POTUS is so eager to rush in and volley, in fact, that probably his biggest weakness is getting caught in no-man's-land, where he is forced to swing up, resulting in weak lob volleys that his regular opponents gobble up as if they were vegetarians and Bush's offerings were delicious broccoli stalks. After this career shot screamed down Smith's alley, we had set point. It was my finest hour on any field of battle. Surely, now we would prevail, and I could walk off the court secure in the knowledge I had helped give my commander in chief at least a split. Then, paradise lost. On the next point POTUS went for one of his patented lob returns -- talk about power outage, who did the President think we were up against, Mike and Kitty Dukakis? -- which Smith corralled and bounced halfway to Canada. "Was that a set point?" Smith asked slyly. Only then did it dawn on me: Was it possible the President didn't even know it was set point? I didn't hear him respond to Smith. Rapidly we lost, oh, it must have been 10 points in a row. That's all. And the momentum changed. That's all. And somewhere in there I choked my fanny off, whiffing that vile overhead, which I will remember until the day I die. The final score was 6-2, 7-5. We played a few more games at the President's insistence -- ''Keep drop-shotting Marlin. He's done,'' the ever-avenging POTUS said of Fitzwater, who was seriously hurting in the 88 degrees heat -- but I don't believe anybody's heart, or limbs, were in it. We had won two games and they had won four when the President finally called a halt before the dogged Fitzwater might have passed out. It was a Pyrrhic "Vic Damone" -- Bush's pet code name for victory -- as I would learn later. Fitzwater was so exhausted, he spent the rest of the afternoon in his hotel room. "Tennis time" couldn't end soon enough for the author after he whiffed this overhead, but Bush told him to "shake it off." "What time is it?" POTUS asked as he stalked briskly from the tennis court. "It's Howdy Doody time," said a voice from courtside, which turned out to be that of the President's chief of staff, John Sununu. I am not making this up. "I would try to encourage you," Barbara Bush said to me, "but you're showing me nothing. I just may have to join in the belittlement." Well, an athlete can take just so much of this, as my leader might say, deep doo-doo. I played four games of the infernal contest of 'shoes. I finally got a presidential scalp -- and almost a presidential dog scalp; Millie ducked just in time -- when Mary Ann Chandler of the White House medical corps (O.K., O.K., she is the reigning White House tournament champion) and I beat George Bush of 1600 Pennsylvania Avenue and George P. Bush, 15, of Miami, 21-13. Later that day POTUS would play another 18 holes of golf and fit in another speed-boating-and-fishing expedition, all before dark. But I was just about finished. "Don't worry about that overhead," the President told me. "You played well. I let you down. We'll get a rematch. I want those guys." Sitting by the pool after horseshoes, I looked over at the President, who at that moment had a couple of his granddaughters hanging all over his head and neck. ''I'm freezing,'' said Jenna. "Hi, Freezing," said George Bush. "Glad to meet you. I'm Gampy." Ultimately, it was quite remarkable what this routine, nonstop sports vacation had done for this effervescently fit sportsman. As the day had worn on, the President had seemed to grow younger. From the side, I swear his face was the same one that adorned the $15 T-shirt on sale in a fashionable Kennebunkport boutique -- the shirt with the picture of a young Navy fighter pilot, his leather helmet flaps unsnapped, his eyes sparkling full speed ahead. Yet that face was at least 45 years younger. "I do feel younger up here," POTUS had said as he strolled from the main house out to the pool. "But I also feel funny in these things; I guess it's the nerd factor." He pointed at his neon yellow aquasocks, currently favored by totally excellent surf dudes and the President of the United States. "Nice shoes," Sam LeBlond, his six-year-old grandson, said. "You kidding? You mean it? Just what?" POTUS demanded. "No, Gampy. I like them," Sam said. Which were my sentiments precisely. The Bush thing? Nice shoes. Nice guy. Nice games. Not bad.